Founded in 1972, The Hellenic Dancers of New Jersey, is a group of 40 young adults who are first, second, or third generation Greek-Americans, and are dedicated to perpetuating their heritage through enthusiastic performances of the regional folk dances of Greece. Under Master Instructor Eleni Chakalos more than 300 dances, songs, and related traditions have been preserved. These are indigenous to mainland Greece, its islands, and Asia Minor, and have been passed on to two generations of Greek Americans and the American public. Their traditional music and folk dance is representative of a cross-section of these diverse regions, past and present. Performed in authentic ethnic dress, the Hellenic's wardrobe represents the 20 regions from which the dances originated, including: Macedonia, Thrace, the Peloponnese, Epiros, Roumeli, Crete, Cyprus, the various island groups; and Pontos, Cappadocia, and Ikonion in Asia Minor. The troupe has performed at Presidential rallies and inaugurations, for the royalty and ambassadors of several nations, the NJ State Ethnic and Diversity Festival, won first prize at the Garden State Arts Center intra-State Competition, sent dancers for the Closing Ceremonies of the 2004 Olympic Games in Athens, Greece, as well as many other Greek and culturally diverse festivals and special programs. and the New Jersey State Council on the Arts. Thank you to all of our friends, family, alumni and supporters who came and made this a wonderful and memorable event. In addition, thanks to everyone that took out an ad in our Electronic Ad Journal! 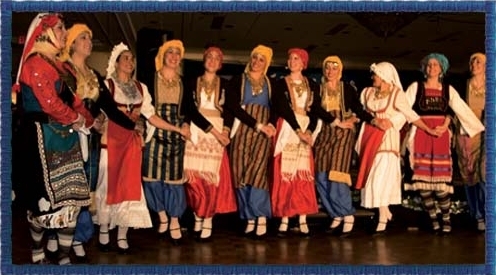 The Hellenic Dancers of NJ is an independent 501(c)(3) non-profit founded in 1972. Please consider supporting us with a tax-deductible donation. You can donate directly and securely via Paypal. Thank you! Amazon has partnered with Hellenic Dancers of NJ through its AmazonSmile program. When you shop at Amazon Smile, everything, including price and selection are the same, except that Amazon will donate a portion of the purchase price to HDNJ (at no cost to you!). Click here to get started.